Participants in Emory's 2014 Campus-wide Energy Competition saved 148,514 kilowatt hours of energy, the equivalent of 102 metric tons of carbon dioxide. The competition, which runs each October, challenges buildings to see which can reduce energy usage the most over the previous October. This year's winners on Emory's main campus are Clairmont Tower (residence hall) with a 12.8 percent decrease and the Administration Building (academic/administrative building) with a 9.8 percent decrease. 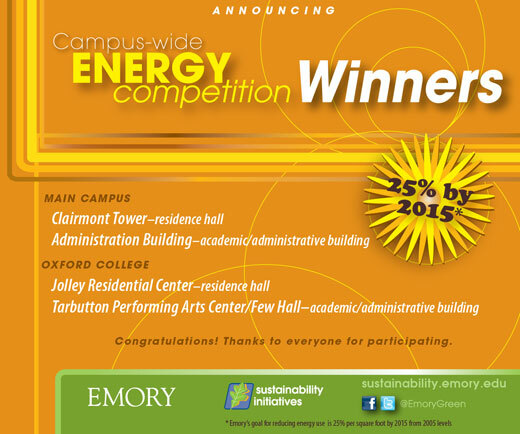 Oxford College campus winners are Jolly Residential Center (residence hall), which decreased energy usage by 15.7 percent, and Tarbutton Performing Arts Center/Few Hall (academic/administrative building), which cited the contest's largest reduction percentage at 21.6 percent. "Our annual Energy Competition is an opportunity to incentivize energy saving behaviors amongst students, faculty and staff," says Ciannat Howett, director of Sustainability Initiatives. "Our goal is that these behaviors will become the norm and will stick with the Emory community throughout the year, not just during October." Efforts made by building occupants to reduce energy usage included turning off lights and appliances when not in use, using lamps instead of overhead lighting, taking stairs instead of elevators, and more. Winners receive $1,000 to use toward a sustainability-related prize. In the past, buildings have purchased items including hydration stations, recycling equipment and energy-free entertainment like foosball tables. According to the Environmental Protection Agency's greenhouse gas equivalencies calculator, the amount of energy saved by all contest participants this year is equivalent to the annual greenhouse gas emissions from 21.6 passenger vehicles or 243,829 miles per year driven by an average passenger vehicle; the carbon dioxide emissions from consuming 11,523 gallons of gasoline or burning 109,998 pounds of coal; or the amount of carbon sequestered by 83.9 acres of U.S. forests in one year.